Networking for Success Training Material is designed for developing employee communication skills. Train your employees and supervisors how to create positive relationships, how to deal with communication barriers, developing listening skills and more! 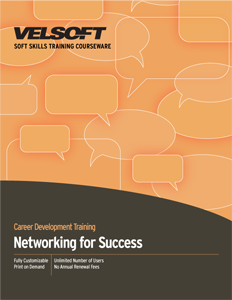 Seeing is Believing This sample manual to teach Networking for Success is in MS Word format. Networking successfully is an essential skill in business. It allows sales professionals and entrepreneurs to expand their presence and do more business! In this two-day course, participants will learn how to present themselves so that people remember who they are and what value they offer, how to use a business card effectively, the importance of follow-up, and how to take their networking from ordinary to where they leverage reciprocity as well as the Internet. Our SoftSkills courses include a suite of tools that trainers love, including a detailed instructor guide, student workbook, preformatted slides, a pre-assignment, and more. Click or call and in no time you'll be able to add your logo, customize the materials to suit learners and your business, and then deliver with confidence.